Johns Hopkins researchers say they have developed an experimental drug, similar to compounds used to treat diabetes, that slows the progression of Parkinson's disease itself—as well as its symptoms—in mice. 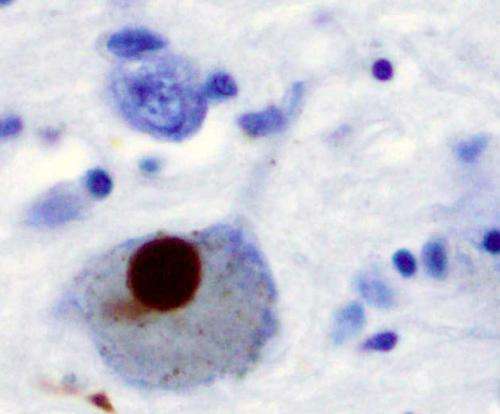 In experiments performed with cultures of human brain cells and live mouse models, they report the drug blocked the degradation of brain cells that is the hallmark of Parkinson's disease. The drug is expected to move to clinical trials this year. To find out, Dawson and his team tested NLY01 on three major cell types in the human brain: astrocytes, microglia and neurons. They found that microglia, a brain cell type that sends signals throughout the central nervous system in response to infection or injury, had the most sites for NLY01 to bind to—two times higher than the other cell types, and 10 times higher in humans with Parkinson's disease compared to humans without the disease. Dawson and his team knew that microglia secreted chemical signals that converted astrocytes—the star shaped cells that help neurons communicate with their neighbors—into aggressive "activated" astrocytes, which eat away at the connections between cells in the brain, causing neurons to die off. They speculated that NLY01 might stop this conversion.